Roy Oxlade emerged in the 1950s as one of a prominent group of London-based painters which also included Frank Auerbach and Leon Kossoff. Taught by David Bomberg, Oxlade remained true to Bomberg's values of authenticity in brush marks, immediacy and truth of feeling, whilst at the same time forming a unique vocabulary of his own. Oxlade's work combines a love of the absurd with wit, sensuality, spontaneous brushwork and a rejection of 'artiness', something he felt damaged art. His paintings evolved from a determination to create 'real' art, freed and uncorrupted by formal painting traditions. Roy Oxlade was born in Tottenham, North London in 1929. While studying at Bromley School of Art, he attended evening classes taught by David Bomberg at the Borough Polytechnic (now London South Bank University). Oxlade completed a one year art teachers diploma at Goldsmiths College, and later, both at the Royal College, he completed his MA thesis 'Bomberg and the Borough - An Approach to Drawing' (1976); and a PHD thesis, 'Bomberg's Papers: The Spirit in the The Mass - A Commentary' (1980). It was at Goldsmiths College that Oxlade met and married fellow art student Rose Wylie, having got engaged after two weeks of meeting each other. Since then, Rose has been a central muse and consistently features throughout his work. In 2016, Rose & Roy, an award-winning documentary by Adolfo Doring and Claudia Baez (2012) was the gala opening film at The New York City International Film Festival. 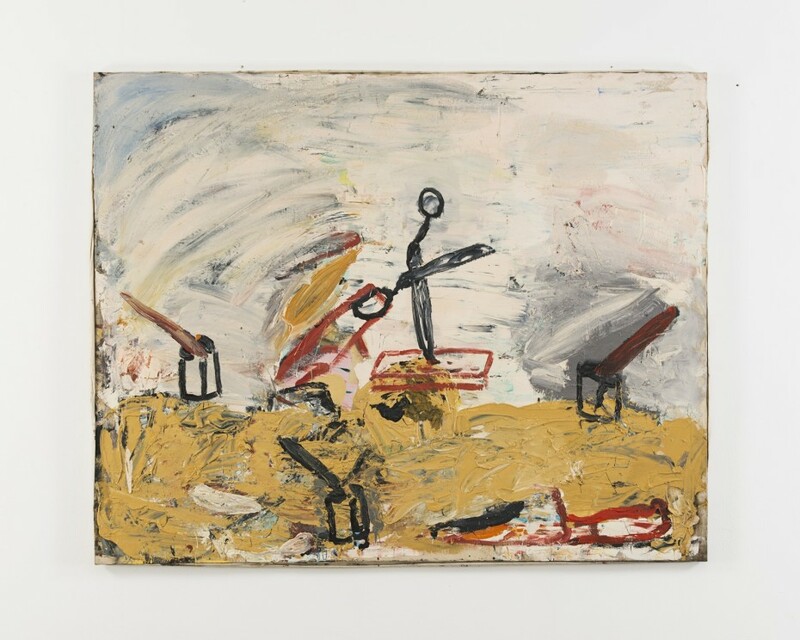 Roy Oxlade's first major solo exhibition was in 1963, at the Vancouver Art Gallery in Canada, and key group exhibitions included the John Moores Exhibition at the Walker Art Gallery, Liverpool (1962), the Hayward Annual (1982) and EAST International at Norwich University of the Arts (1991). In 2000, he was included in not enough British Art at the Velan Center for Contemporary Art, Turin, and in Towards Night at the Towner Art Gallery, Eastbourne (2016). Alongside his own work, Roy Oxlade was a hugely influential figure in art education. An outstanding teacher, he was also a highly prolific writer on art and contributed regularly to Modern Painters, Art Monthly, Blunt Edge and The London Magazine. In 2010, Ziggurat Books published Art & Instinct, Selected Writings of Roy Oxlade.